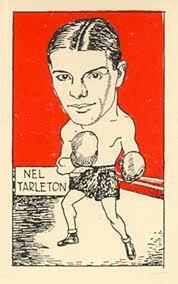 Nel Tarleton rules the ring at Anfield – "Play Up, Liverpool"
By a brilliant display of boxing, Nel Tarleton, the British Feather-Weight Champion, outpointed Al Foreman, Light-Weight Champion, in their 12-round contest on the Liverpool Football Ground last night. Tarleton’s speed, elusiveness, and his superior boxing proved too much for Foreman, who was unable to cope with his opponent’s furious rushes. Foreman pinned his faith on his right hand, which has won so many fights for him, but although he had Tarleton on the floor in the third round he could not land a telling blow. When the end came both men were standing in the middle of the ring exchanging blow for blow.